February 14 2019: As the nation celebrated love, 40 CRPF soldiers became victims of a terror attack. February 15 2019: Indians spewed criticism at the PM for not retaliating and caring more about his political campaign. February 26 2019: The airstrike by IAF dropped 6 bombs at a terrorist camp in Balakot, killing over 300 terrorists. As the nation suffered a tragedy and its aftermath, a new question was finally brought to limelight: are we too quick to form our first and final judgement? First impression: As the govt. invested whopping INR 2989 crores in this 182-metered statue, all hell broke loose with comments about how this money could have been utilised somewhere better. 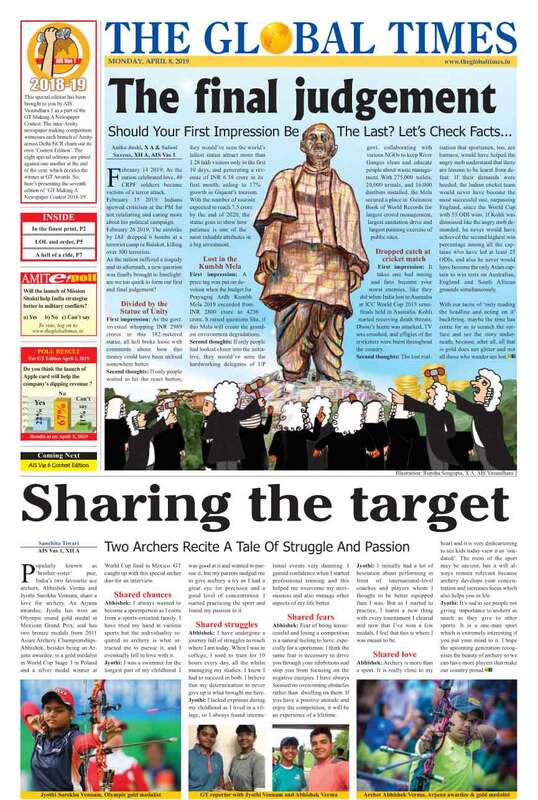 Second thoughts: If only people waited to hit the react button, they would’ve seen the world’s tallest statue attract more than 1.28 lakh visitors only in the first 10 days, and generating a revenue of INR 6.38 crore in its first month, aiding to 17% growth in Gujarat’s tourism. With the number of tourists expected to reach 7.5 crore by the end of 2020, the statue goes to show how patience is one of the most valuable attributes in a big investment. First impression: A price tag was put on devotion when the budget for Prayagraj Ardh Kumbh Mela 2019 exceeded from INR 2800 crore to 4236 crore. It raised questions like, if this Mela will create the grandest environment degradations. Second thoughts: If only people had looked closer into the initiative, they would’ve seen the hardworking delegates of UP govt. collaborating with various NGOs to keep River Ganges clean and educate people about waste management. With 275,000 toilets, 20,000 urinals, and 16,000 dustbins installed, the Mela secured a place in Guinness Book of World Records for largest crowd management, largest sanitation drive and largest painting exercise of public sites. First impression: It takes one bad inning and fans become your worst enemies, like they did when India lost to Australia at ICC World Cup 2015 semi-finals held in Australia. Kohli started receiving death threats, Dhoni’s home was attacked, TV sets smashed, and effigies of the cricketers were burnt throughout the country. Second thoughts: The lost realisation that sportsmen, too, are humans, would have helped the angry mob understand that there are lessons to be learnt from defeat. If their demands were heeded, the Indian cricket team would never have become the most successful one, surpassing England, since the World Cup with 53 ODI wins. If Kohli was dismissed like the angry mob demanded, he never would have achieved the second highest win percentage among all the captains who have led at least 25 ODIs, and also he never would have become the only Asian captain to win tests on Australian, England and South African grounds simultaneously. With our tactic of ‘only reading the headline and acting on it’ backfiring, maybe the time has come for us to scratch the surface and see the story underneath, because, after all, all that is gold does not glitter and not all those who wander are lost. Popularly known as ‘brother-sister’ pair, India’s two favourite ace archers, Abhishek Verma and Jyothi Surekha Vennam, share a love for archery. An Arjuna awardee, Jyothi has won an Olympic round gold medal at Mexican Grand Prix, and has two bronze medals from 2011 Asian Archery Championships. Abhishek, besides being an Arjuna awardee, is a gold medalist in World Cup Stage 3 in Poland and a silver medal winner at World Cup final in Mexico. GT caught up with this special archer duo for an interview. Abhishek: I always wanted to become a sportsperson as I come from a sports-oriented family. I have tried my hand at various sports but the individuality required in archery is what attracted me to pursue it, and I eventually fell in love with it. Jyothi: I was a swimmer for the longest part of my childhood. I was good at it and wanted to pursue it, but my parents nudged me to give archery a try as I had a great eye for precision and a good level of concentration. I started practicing the sport and found my passion in it. Abhishek: I have undergone a journey full of struggles to reach where I am today. When I was in college, I used to train for 10 hours every day, all the whilst managing my studies. I knew I had to succeed in both. I believe that my determination to never give up is what brought me here. Jyothi: I lacked exposure during my childhood as I lived in a village, so I always found international events very daunting. I gained confidence when I started professional training and this helped me overcome my nervousness and also manage other aspects of my life better. Abhishek: Fear of being unsuccessful and losing a competition is a natural feeling to have, especially for a sportsman. I think the same fear is necessary to drive you through your inhibitions and stop you from focusing on the negative energies. I have always focused on overcoming obstacles rather than dwelling on them. If you have a positive attitude and enjoy the competition, it will be an experience of a lifetime. Jyothi: I initially had a lot of hesitation about performing in front of international-level coaches and players whom I thought to be better equipped than I was. But as I started to practice, I learnt a new thing with every tournament I cleared and now that I’ve won a few medals, I feel that this is where I was meant to be. Abhishek: Archery is more than a sport. It is really close to my heart and it is very disheartening to see kids today view it as ‘outdated’. The roots of the sport may be ancient, but it will always remain relevant because archery develops your concentration and increases focus which also helps you in life. Jyothi: It’s sad to see people not giving importance to archery as much as they give to other sports. It is a one-man sport which is extremely interesting if you put your mind to it. I hope the upcoming generation recognises the beauty of archery so we can have more players that make our country proud. Copyright © 2008 Amity University. All rights reserved.